Meet Mia. I expect her to stick with me through all kinds of seasons, carry my burdens (wallet, cell phone, car keys, journal), and keep my secrets. I also expect her to lose lots of things because she is BIG! (I put my car keys in there for 30 seconds and already I lost them this morning [it may have been because I was still half asleep though...]). I'm not sure how she got so big, but it's a much bigger bag than I usually carry. It's not tote bag size by any means, just bigger than I intended. Sometimes I see people with bags big enough to hold small children or animals and I think "What DO they put in that thing?" We'll see what I can fit in there. I designed the bag myself. It's inspired by a shirt I have that is all gathered on the yoke. I thought that it would translate well into a bag and I'm pleased with the result. Realizing a bag this size needs organization, I put in a zip pocket, a slip pocket, some pen pockets and an elasticized water bottle holder (I'm guilty of putting my water bottles in my small purses so I figured I'd better make provisions before I've got 4 or 5 in here). 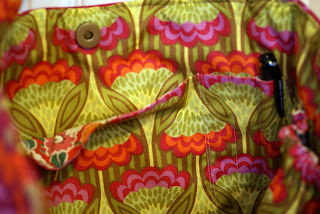 The zip pocket (using fabric from the Oliver and S dress). 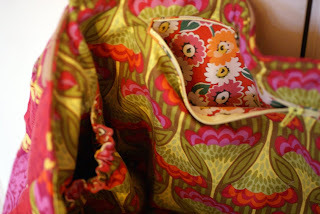 The fabric and lining fabrics are both from Anna Maria Horner from her Garden Party line. I love the unexpected color combinations! Right now...I am seriously jealous because I LOVE THAT BAG!...I want it to be MINE!! 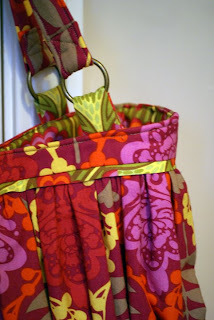 I love the combination of patterns...the colors...the size...I have a love for big bags...and the water bottle pocket was a great idea! I always have a bottle of water in my bag...I love, love, love it! I will be thinking of how much I want this bag all night now!! i love the pattern on the inside of the bad and the inside of the pocket...especially together. Really though, I love it, & I want it Keri! Thanks again for setting up this Blog Group, I've already met some nice people through it! DARN! That is so amazing, it isn't even funny. I love the fabric, the idea of it - I'm just in awe! wow GORGEOUS bag, you did an amazing job! I love Anna Maria's fabric and you used it perfectly. I can hear all the ooh's and aah's you'll be getting when you use this, and the inevitable "you MADE that?!!?" I love this bag! Your invisible pocket is impressive too. Congrats! I love Mia. She's beautiful! 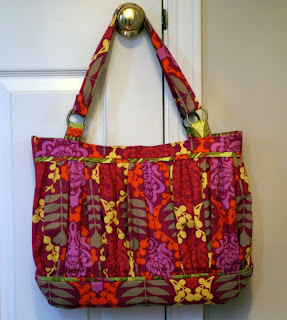 I heart this bag, definintely need to figure out sewing machine pronto!